The 28th of August is the day that the city of Groningen commemorates the end of the Siege of Groningen, more colloquially known as Bommen Berend. So how did this local holiday become a tradition? Bommen Berend (“Bombing Bernard”) is the nickname for the former bishop of Munster, Bernard van Galen. The year of 1672 was disastrous for the Dutch Republic: there were simultaneous attacks from England, France, the archbishop of Cologne and the bishop of Munster. Bernard van Galen attempted to besiege Groningen, but the city was able to put up a good fight under the leadership of another German man, Carl von Rabenhaupt. Groningen’s ability to withstand the onslaught meant that the Republic was better able to respond to ongoing attacks from France and England. If Groningen had fallen during the siege in 1672, the province may very likely be speaking German today and have become a Catholic stronghold like Munster. Christoph Bernhard Freiherr von Galen (usually referred to as Bernard van Galen) (Drensteinfurt, 12 October 1606 – Ahaus, 19 September 1678), became the bishop of Munster in 1650 and the abbot of Corvey in 1663. Von Galen was a famous German warlord who invaded the Netherlands twice: once in 1665 and again in the so-called disaster year of 1672. His territory along the German border stretched from Zutphen in the south to the the Dollard bay in the north (with the exception of Lingen and Bentheim). Von Galen was an absolutist ruler who limited the power of the guilds in Munster when they sought an alliance with the Hanseatic cities. Von Galen also succeeded in kicking out the Swedish, Hessian and Holland forces in Germany at the time. Today, Bommen Berend is best known for laying siege to the cities of Groenlo, Bredevoort, Coevorden and Groningen. Throughout his diocese, Von Galen proved himself to be a formidable representative of the counterreformation with a strong emphasis on helping the poor and improving education. What’s up with the nick name? Von Galen has a well-known preference for the smell of gun powder over incense, and that predilection towards violence over peaceful prayer is reflected in the name he is known by nowadays: Bommen Berend. He had plenty of other nicknames, including the Bishop of Cannons and the Bishop of Swine: in satirical publications of the day, the Hothead of Westfalen was depicted as riding a swine (the British drew him as a dog, and the French chose a rooster to symbolise him). Von Galen was even occasionally described as The Beast from the book of Revelations in the bible. Since 2011, the “Augustus Rede” has been held each year during the Bommen Berend holiday in Groningen – it was previously known as the 28th of August Debate. This year’s lecture was given by professor Rob de Wijk, who teaches international relations at the University of Leiden. 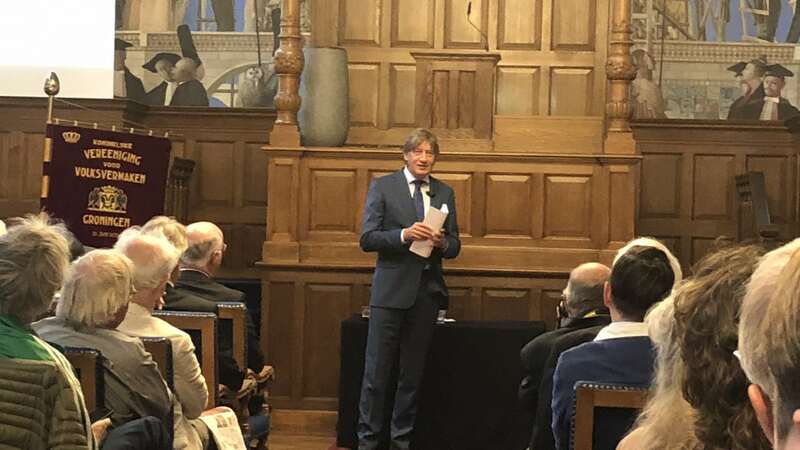 During his reading in the aula of the academy building at the University of Groningen, the Groninger Internet Courant reports that De Wijk made the case that the free society of the Netherlands is under threat due to populism domestically and the economic dominance of China abroad. De Wijk’s lecture, titled “Is Freedom a Given?”, focused on how the liberal world order is at risk due to populist politicians threatening citizen’s fundamental rights in the name of protecting them. De Wijk also cited the lack of freedoms in Chinese society as a rising threat due to the nation’s increasing dominance on the economic stage. Cabaretier Freek de Jonge, king’s commissioner René Paas, European Parliament member Marietje Schaake, professor Geert-Jan Knoops and former Amsterdam mayor Job Cohen are among the former featured speakers in recent years.